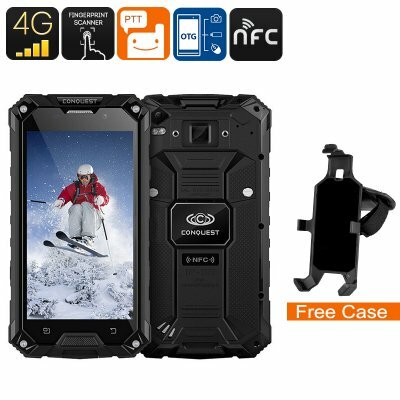 Successfully Added Conquest S6 Rugged Phone - IP68, Octa-Core CPU, 5 Inch HD Display, 4G, Dual-Band WiFi, NFC, Fingerprint, Android 6.0 (Black) to your Shopping Cart. Meet the Conquest S6 Android phone. This rugged smartphone is extremely durable and features an IP68 design. Thanks to this, the cell phone is resistant to water, drops, and dust. No matter where you head next, this Android smartphone will follow you. It furthermore comes with a sophisticated SOS features. This makes your 5-inch smartphone the perfect tool for outdoor enthusiasts. Packing a 6000mAh battery, this Android phone lets you head out without needing to worry about battery life. It supports up to 16 hours of continuous usage time. This is enough to get you through multiple days of regular smartphone usage. With its Android 6.0 operating system, this rugged phone treats you with a smooth experience. It supports the latest software features available on today’s market. Thanks to this, you’ll be able to play games, enjoy mobile apps, and so much more. Access to the Play Store provides you with unlimited access to the latest media. With the Conquest S6 at your side, you’ll never have to feel bored again. The phone comes with an Octa-Core CPU and 3GB RAM. This means you’ll be able to enjoy demanding games and movies at any time. An HD display brings along vivid colors and great graphics. This truly will enhance your mobile media experience no matter where you’re at. With 32GB internal memory, this rugged phone packs plenty of memory. For the excessive media lovers among us, the phone also comes with an additional 32GB SD card slot. It furthermore supports OTG that lets you connect external hardware devices to your smartphone. NFC is also in place to further enhance your user experience by allowing wireless transactions. In terms of connectivity, the Conquest S6 is a great Android phone. It supports both 4G and Dual-Band WiFi. This means that no matter where you are, you’ll always be able to stay connected. Whether you like to stream a movie online or engage in an online video call – this phone handles it all. It furthermore comes with a 13MP camera. This cam allows you to snap breathtaking images with your smartphone the next time you head out on an adventure.